Acai berries come from palm trees that are indigenous to the Brazilian rainforest. For hundreds of years the small dark berries have been integral to the diet of native Amazon people. Acaí berries are a good source of anthocyanins and have been found to contain certain vitamins, minerals, amino acids, enzymes and essential fatty acids. Acai is widely acknowledged to have one of the highest nutritional value of any fruit, hence its association with the term 'superfood'. Acai fruit, (euterpe oleracea) juice Complex, Oxy3 10% (proprietary blend of Red Grape, Lycopene and Resveratrol), Ascorbic Acid, Potassium Sorbate. Free From Artificial colours & flavours, sucrose, thickeners, gelling agents and gluten. 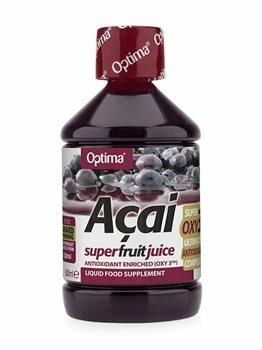 Acai Juice can be taken direct from the bottle (20ml serving) or, if preferred, can be diluted to taste. Avoid use whilst pregnant or breast feeding. Refrigerate after opening and consume within one month. I've just bought this juice and have read the label twice. It says you can drink 20ml straight or dilute it, it doesn't however state how many times a day to have it or the best time to drink it which is a bit of a let down. Is it like any other juice...drink as much as you like when you like? I spoke with Ransom and they said you only need one serving a day. 2 if you need to boost your weight lose initially, but only one is required.